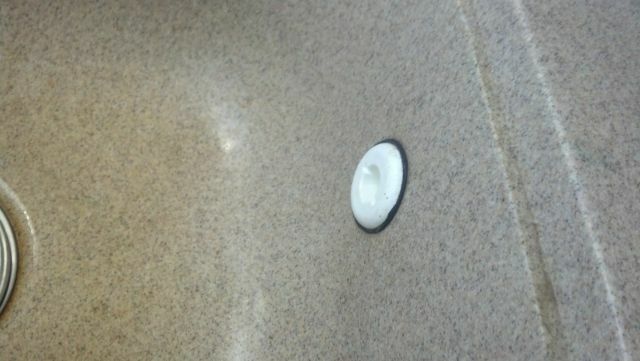 Yep, it sets on the counter just right of the sink. We got it at Walmart and love it. It sets on the counter where all the dirty pots, pans, and dishes used to set. Thanks. I searched for a similar topic and never found it. 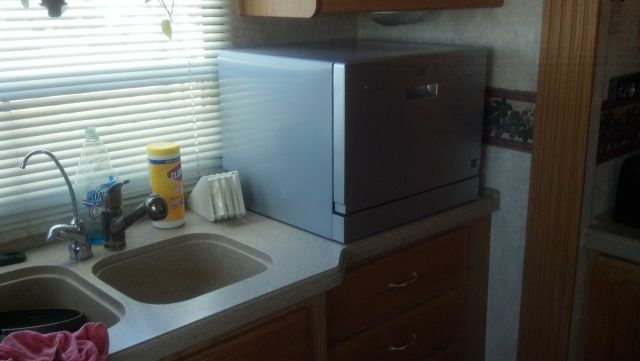 On our previous rig, we had the countertop dishwasher that washed about four place settings. It cleaned very well, but the drying cycle consisted of leaving the door open and air dry. The 3400 had a large counter so the space it took up was not an issue. On our new rig, we have been blessed to have the room for an apartment style rolling portable dishwasher that handles ten place settings. It is a matter of convenience for us (that should read DW! ), and is a welcome addition to the rig. Bingo, how does the dishwasher attach to the water? We got tired of the plastic fitting falling off so we kind of sorta made ours semi permanent with the water and discharge hoses. Since the hot water heater is underneath the counter the dishwasher is setting on, the water fitting was pretty simple. The discharge hose was another matter. We decided we didn't want all the extra food and gunk going into the holding tank and forming a pyramid that would be impossible to clean out so I went to a marine store and bought a 90 degree elbow for a live well in a boat. Then drilled a hole in the sink, attached the discharge hose to the elbow. Now when the water and extra food particles drain, they drain into the sink where we filter them. 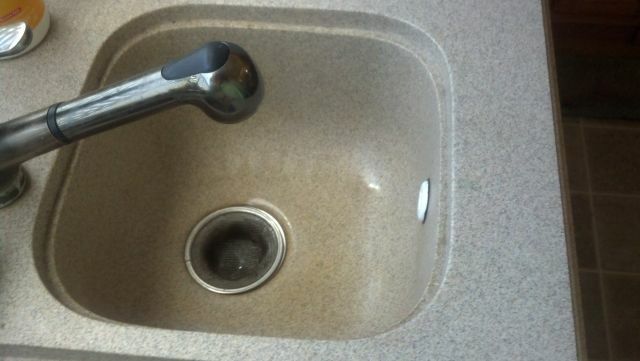 It's not an eye sore because you have to lean over the sink to see it. We do not feel a need for one since there are only two of us. We also agree that the counter space is better used for other things. Different strokes for different folks! For us/me, the house husband, that has been on Social Security Disability for the last 12 years, our dishwasher is a god send. I have a very hard time bending over the sink for even the amount of time it takes to wash 2 pans, glasses or whatever. So Please don't belittle us that need/want such items. To each his/her own, but just remember everybody can't use their back and legs like we used to. 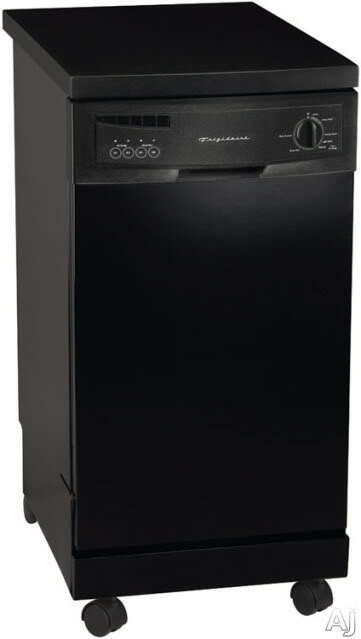 Any appliance that helps me do my duties of doing my fair share I'm going to have. I'm sorry, but every time a post comes up like this, there is always someone that has to say they don't need this. Great, I hope you never NEED anything like this, but some of us do. I'm not trying to make enemies, but this finally hit a nerve. WOW! Your reply prompted me to reread my previous reply 6 times to see what I could have possibly said to belittle you or anyone else. Couldn't see anything so I stand by my comments as stated. I am sorry you are apparently having a bad day and hope it gets much better. I deleted my reply that WeBeFulltime is referencing as the wrong people took offence to my post. Guess I didn't take enough pain meds today. It's all good, I'm disabled myself and I'm lucky to have a healthy wife to do those things If I did not I would be all over ANYTHING that helps me with those chores or if I just hated doing dishes, and I know they work well that's a bonus! Alwims, I like your mod. I was concerned about the food going in the galley tank as well. Something for me to contemplate. Thanks for the photos. I just wanted to add, I'm not one that will wash the dishes before washing the dishes. As a matter of fact I just barely wipe out all the food before putting it in the dishwasher. The screen in the sink catches quite a bit of food that would have otherwise went into the tank. Also, drying has never been a problem either. There have been times I didn't open the door until the next morning and the dishes were dry as a bone with no spotting. There is no drying cycle, but I believe it heats the water so hot that it helps to dry the dishes when all the rinse water is pumped out.